This is one they don’t teach in Thai cooking classes much, they tend to stick to simpler dishes, but don’t let that put you off, below are full and detailed instructions, nothing is left out plus a video to help, it’s all in the preparation. 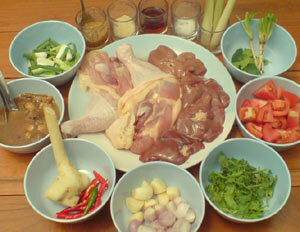 Our Thai Food Blog-Tom Kaa Gai has lots of useful tips about how to choose the best ingredients. Cut lemon grass at an angle, see video tutorial. Slice Galangal, penny thickness or less. If it’s a tender young Galangal you can leave the skin on. When happy with the taste, add tamarind puree, coriander and spring onions, mix in thoroughly & remove from heat. That’s it folks! Done! Serve into a large bowl. Eat with jasmine rice (traditional). A great recipe to compliment this lovely Tom Kaa Gai recipe is, (as Khwanjai suggests), our Sweet and Sour Stir Fried Pork or our Egg Fried Rice both of which have non spicy, slightly savoury flavours. 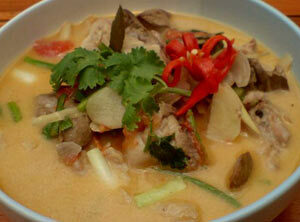 If you fancy a non-spicy soup, you should try Khwanjai’s warming (meal in a bowl) Thai Chicken Soup. Longer video this one, just over 9 minutes, because we wanted to show you the finer points of this wonderful soup recipe with some really good close-ups. I have eaten this more times than I care to remember when it was over spiced or the subtler flavour just missing because of poor preparation. Needless to say Khwanjai didn’t cook on those occasions. Enjoy! We really recommend you print out the recipe first, as there are lots of ingredients, the ingredients listed in the recipe are the actual amounts Khwanjai used “in total”, you’ll see what I mean by that in the video. Just found these classes. Thanks so much. Love the recipes, but love the interaction between you two, it makes it fun to watch. I’m obsessed with Thai cooking and plan on watching all of these! !